Back when I was little, new parents had just one choice to make about diapers. They could use plain white cotton diapers, secured with safety pins and covered in plastic pants to protect against leaks, or they could use bulky, expensive disposable diapers. Cloth diapers were undeniably cheaper, but they were also a lot more work, and for working moms with kids in daycare, disposable was often the only option. How times have changed. Today, not only are more dads changing diapers, but all parents have a breathtaking array of options when it comes to what kind to use. The plain cotton diapers I wore as a baby are still around, but there are also all kinds of fancy “diaper systems” that make cloth diapering more convenient – and also more expensive. 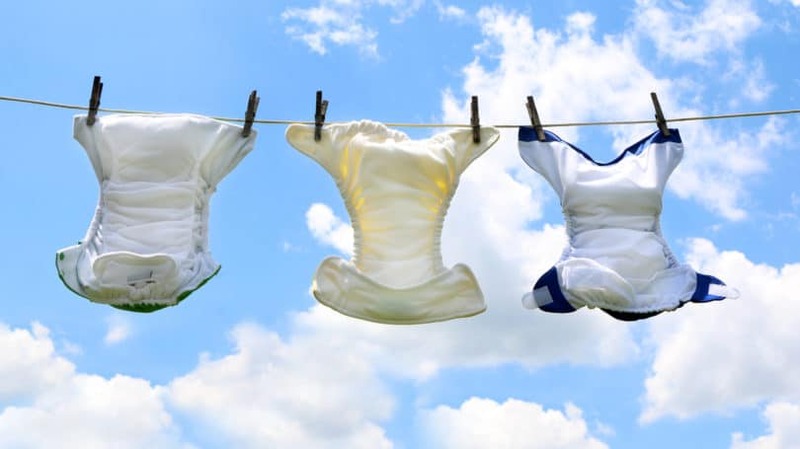 Additionally, busy parents have the option of renting their cloth nappies through a diaper service that takes away all the dirty diapers each week and delivers a fresh supply of clean ones. Disposable diapers have changed too. New super-absorbent polymers have greatly reduced their bulk, and they’re now available in a wide variety of colors and patterns. For eco-conscious parents, there are “green” disposable diapers that are chlorine-free, biodegradable, or made with renewable resources. There are even diaper systems that blur the line between cloth and disposable, combining a cloth outer garment with a disposable insert. The huge number of available choices can be overwhelming – particularly for new parents, who are already juggling a thousand different jobs and getting far too little sleep. I can’t tell you which kind of diaper is best, but I can do the next best thing: Provide you with a clear, straightforward rundown of the pros and cons of each type, so you can make an informed choice about what works best for you. For decades, disposable diapers have been the default choice for busy parents. The Real Diaper Association, a nonprofit group that promotes cloth diaper use, estimates that between 90% and 95% of American babies wear disposable diapers. All those diapers cost a lot of money – and they have environmental costs too. However, for most parents, the convenience of being able to toss a dirty diaper in the trash and be done with it makes them worth it. All disposable diapers have the same basic construction. There’s a waterproof outer layer, a soft inner lining that wicks away moisture, and in between, an absorbent core of super-absorbent polymer (SAP) that pulls in and traps moisture. Disposable diapers have adhesive tabs for fastening, coupled with elastic at the leg and waist to hold them snugly in place. However, some disposable diapers have additional features to make them both more eco-friendly and healthier for babies. Parents may choose “green” disposables because their babies have allergies or chemical sensitivities, because they want to reduce their children’s exposure to synthetic chemicals, or because they want to tread lightly on the Earth. Biodegradable or Compostable. The editors at the review site BabyGearLab describe these claims as “misleading marketing-spin.” Even if a diaper is made of materials that could break down when exposed to air, water, and sunlight, most disposable diapers actually end up in dark, airless landfills, where they will remain essentially unchanged for centuries. In 2014, the Federal Trade Commission (FTC) charged the makers of gDiapers, a hybrid diaper system, with making misleading claims that their disposable diaper inserts were biodegradable and compostable. According to the FTC, gDiapers do not really biodegrade when thrown in the trash, and they can only be safely composted at home if they don’t contain any solid waste. Chlorine-Free. Most disposable diapers are bleached with chlorine. This process leaves behind traces of chemicals called dioxins, which can cause cancer and damage to the immune and reproductive systems. Studies show that diapers contain only tiny amounts of dioxins, and they don’t contain the most potent and dangerous forms of these chemicals. However, if you think any exposure to dioxins is too much, choosing chlorine-free diapers eliminates the risk. Fortunately, many low-priced brands, such as Target’s Up&Up ($0.14 per diaper), fall into this category. Dye- and Fragrance-Free. Some babies are allergic to the fragrances and dyes used in disposable diapers. These chemicals also serve no useful purpose, since adding fragrance doesn’t do much to improve the smell of a dirty diaper. If you know your baby is allergic to these chemicals – or if you don’t want to wait until a reaction develops to find out – look for diapers that are free of dyes and fragrances. It’s possible to find low-priced brands that are fragrance-free, such as the Parent’s Choice brand sold at Walmart ($0.17 per diaper). Dye-free diapers are harder to find and tend to be pricier; the cheapest one in BabyGearLab’s test is Earth’s Best ($0.36 per diaper). Hypoallergenic. In theory, a hypoallergenic product is one that’s less likely to cause an allergic reaction. However, according to the Food and Drug Administration (FDA), this term has no legal meaning. Although most diapers don’t claim to be hypoallergenic, those that do aren’t required to submit any evidence for the claim to the FDA. The best way to avoid allergic reactions from disposable diapers is to choose diapers without dye or fragrance. Disposable diapers vary widely in price. Bambo Nature, the top-rated eco-friendly disposable at BabyGearLab, costs $0.48 per diaper. However, the Best Value pick, Cuties, cost only half as much per diaper, and the cheapest diapers in the test, the Up&Up brand from Target, cost just $0.14 each. The editors estimate that a typical baby uses a total of 6,000 diapers in the first three years of life. Thus, they calculate the total cost of disposable diaper use to be $1,440 for the value-priced Cuties diapers and $2,880 if you choose the top-rated Bambo Nature. Earth’s Best Tender Care, their best-value pick among green diapers, falls right in between at $2,160. The editors note that these price estimates are a bit on the high side. Buying in bulk from a subscription program like the one at Amazon.com can cut prices on most brands by about 20%. However, they still cost quite a bit more than cloth diapers laundered at home – particularly if you can reuse the cloth diapers for a second child. Having a baby in diapers requires more equipment than just the diapers themselves. For starters, you need a sturdy diaper pail to hold the dirty diapers and block out unpleasant smells. The top-rated diaper pail at BabyGearLab is the Playtex Diaper Genie Essentials, which has a secure seal and seven-layer disposable bags to lock in odors. However, these fancy bags make the system expensive – although it costs only $20 to buy, adding in three years’ worth of bags raises the overall cost to around $300. At the other end of the price spectrum, a diaper pail can be as simple as a regular garbage can with a tight-fitting lid. If you buy a basic kitchen garbage can and line it with ordinary trash bags, your lifetime cost can be as low as $75. However, this system won’t do nearly as good a job of controlling odors as the Diaper Genie. Another added expense is baby wipes. In their comparison of cloth versus disposable diapers, the editors at BabyGearLab estimate that disposable baby wipes cost $0.02 to $0.04 each, and you can expect to use one to four of them per diaper change, adding up to about $360 over the course of three years. Some baby wipes claim to be flushable, but tests at Consumer Reports show they don’t actually break down properly in the sewage system. Of course, convenience is the reason most parents choose disposables. But disposable diapers do involve some work – according to the Real Diaper Association, they can approximately double the amount of trash a family has to haul to the curb each week. But for most parents, that takes a lot less effort than laundering a load of cloth diapers every other day. Some parents who would prefer to use cloth diapers end up choosing disposables because their babies are in daycare. Many daycare centers don’t allow cloth diapers, and in a few places, there are actually state or local regulations that require them to use disposables. However, Cloth Diapers in Daycare – a joint project between the Real Diaper Association and a related trade group called the Real Diaper Industry Association (RDIA) – reports that parents who are determined to use cloth diapers can sometimes persuade daycare centers to change their rules. 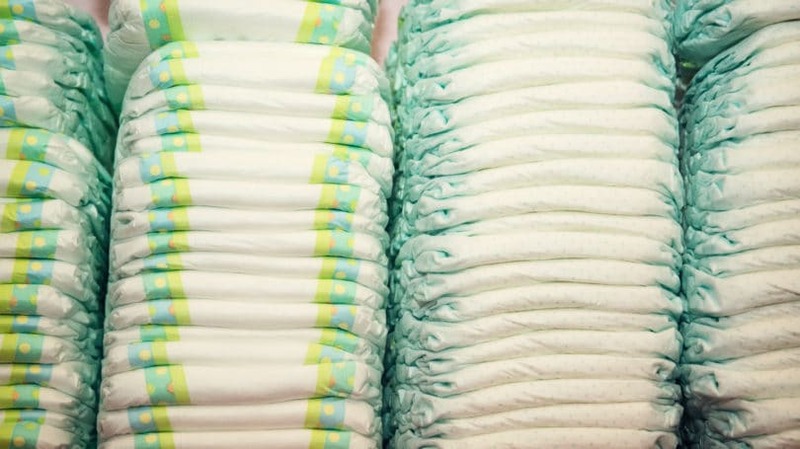 The Real Diaper Association estimates that Americans send more than 27 billion diapers to landfills every year, where they take more than 250 years to decompose. 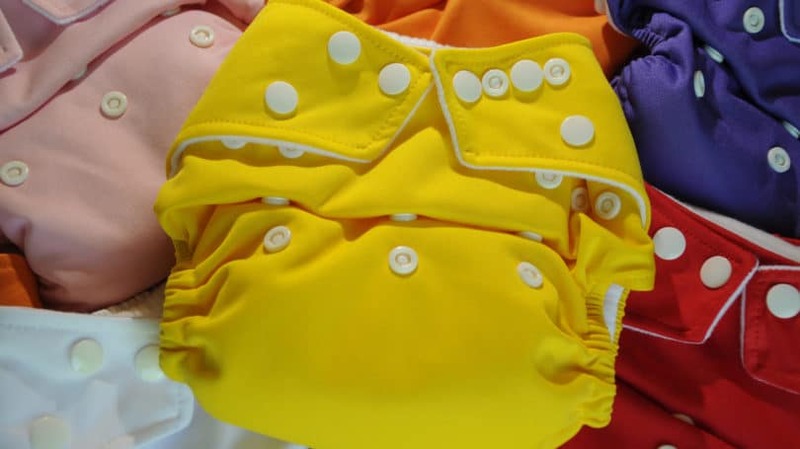 It also claims that compared to cloth diapers, disposable diapers use 20 times more raw materials, such as crude oil and wood pulp, and 2.3 times more water to produce and use. However, all these facts come from books and studies that are more than a decade old. More recent studies have cast doubt on whether disposable diapers are really worse overall than cloth ones. Most notably, the UK Environmental Agency reported in 2008 that the global warming impact of cloth and disposable diapers is about the same, although cloth diapers can be more or less green depending on how they’re used. One major problem with disposable diapers is that many parents simply wrap up the baby’s poop inside before tossing them in the trash. BabyGearLab points out that this is technically illegal in most parts of the United States, where laws prohibit putting human feces in a landfill for fear that it could contaminate the water supply. This is the main reason the site’s editors consider cloth diapers to be a more eco-friendly choice than disposables. For parents who use disposable diapers, they say, the responsible thing to do is dump out any solid waste into the toilet before putting the diaper in the trash – which, of course, takes a lot away from the convenience that’s the main perk of using disposable diapers in the first place. SAP. All disposable diapers contain super-absorbent polymer, or SAP. This concerns many people because SAP was also used in super-absorbent tampons that were linked to a serious illness called toxic shock syndrome. However, most experts think the SAP was not responsible for this problem, and no scientific studies have found SAP to be harmful. Still, some parents worry that the chemical hasn’t been tested thoroughly enough to prove that it’s safe. Phthalates. These chemicals, also known as plasticizers, are added to plastics to make them softer and stronger. According to the National Institutes of Health (NIH), the exact health risks of phthalates are not yet fully known. However, at least one type is generally considered to be a carcinogen, and there’s also some evidence that they can damage the developing reproductive system in male infants. Not all diapers contain phthalates, but those that do aren’t required to say so. The only way to be sure a diaper doesn’t contain these chemicals is to look for a brand that promises it’s phthalate-free. Fragrances. Many disposable diapers have fragrance added to cover unpleasant smells. However, many fragrances contain chemicals that can cause skin rashes and respiratory problems. The FDA doesn’t require companies to say which chemicals their fragrance formulas contain, so the only way to avoid potentially harmful ones is to choose diapers that are fragrance-free. Dyes. Chemical dyes are another ingredient that can irritate babies’ skin. Like fragrances, dyes are hard to identify from product labels – they’re identified by a variety of terms, such as pigments, colorants, and inks, none of which has any clear legal definition. Even brands that are labeled as “dye-free” may contain “pigments.” The best way to avoid problems with dyes is to choose diapers that have no obvious colors in the parts that touch the baby’s skin, such as the leg cuffs. Parents who are concerned about these chemicals should look for “green” diapers, which are more likely to be free of chlorine, fragrances, and dyes. As a bonus, BabyGearLab found in its disposable diaper tests that green diapers tend to be more absorbent than other disposable diapers. This means they are also likely to do a better job of keeping babies dry and preventing diaper rash. In the past, the biggest advantage of cloth diapers was their lower cost, and the biggest drawback was the work involved. This is still true to a large extent, but modern diaper systems have changed the equation somewhat. Cloth diapers still have clear advantages and disadvantages compared to disposables, but the differences are less extreme than they used to be. Shopping for cloth diapers can be bewildering. There are so many different terms – pocket, all-in-one, all-in-two, hybrid – and to make matters more confusing, some of these names can be used interchangeably. Prefold. These are the basic cloth diapers I grew up with: a flat rectangle of cloth, usually thicker in the middle. They’re called prefolds to distinguish them from the still older flat diaper, which is seldom seen nowadays. However, despite the name, prefold diapers still require some folding before you can fasten them on the baby, as shown in this article from the RDIA. Prefold diapers are versatile and easy to clean and dry, but they’re also bulkier than other types of cloth diapers, and tests at BabyGearLab show that they don’t absorb moisture as well. Prefolds are the cheapest type of diaper, costing $1.70 to $3.33 apiece at Diapers.com. However, because prefold diapers come in multiple sizes, they need to be replaced periodically as the baby grows, and they also require a separate cover to secure the diaper in place and protect against leaks. Adding all these costs together, the editors at BabyGearLab estimate that prefold diapers cost about $255 for three years of use. Fitted. A fitted diaper is built much like a disposable, with multiple layers of absorbent material, leg and back elastic, and snaps or hook-and-loop tape to hold them in place. However, unlike disposables, they don’t have a waterproof outer layer, so they require a separate cover. Most fitted diapers come in multiple sizes, but a few brands have snaps that allow them to adjust to your baby’s growth. Fitted diapers are more expensive than prefold diapers, but they’re also more absorbent and easier to fasten, and the leg elastic does a good job keeping messes contained. Fitted diapers cost around $15 each at Diapers.com, but the need for multiple sizes and separate covers makes their lifetime cost hard to estimate. All-in-one. An all-in-one diaper is like a fitted diaper, but with a waterproof outer layer built in, eliminating the need for a separate cover. This makes them quick and easy to change, and daycare centers often prefer them for this reason. However, because all their parts are sewn together in a single piece, they take up more room in the washer, which means more loads of laundry – and their bulk means that each load takes a long time to dry. All-in-one diapers are also the most expensive type to use, costing anywhere from $600 to $900 from birth until the baby is potty trained. Pocket. A pocket diaper has two parts: an outer shell with elastic legs and snap or tab fasteners, and a removable insert. The shell itself has two layers: a waterproof outer layer, and a soft lining with a pocket opening much like a kangaroo’s pouch. The insert, also made of soft cloth, tucks into this pocket, where it funnels moisture away from the baby’s skin. Another advantage is that you can stuff in a second insert for extra absorbency at night. Pocket diapers are easy to fasten, and they don’t require a separate cover. However, they’re also bulky, and because both the pocket and the insert get soiled when the diaper is used, they must both be washed after every use. In addition, removing the insert can be a messy process. In terms of price, they’re less expensive than all-in-ones, but more expensive than hybrid or all-in-two diapers. The top-rated pocket diaper at BabyGearLab has an estimated lifetime cost of $720. All-In-Two. Like a pocket diaper, an all-in-two has both a shell and a liner, but the liner simply sits on top of the shell instead of tucking in. This makes it much easier to remove the liners after use and also to get a fresh diaper ready to go on the baby. However, the biggest advantage of all-in-two systems is that most of the time, only the liner gets soiled, so the shell can be reused, which makes for far less laundry. Also, because you don’t need to change the shell every time, you don’t need to buy as many of them, which makes the all-in-two much cheaper to use than all-in-one or pocket diapers. All-in-twos are sold both in multiple sizes, which you replace as your baby grows, and as one-size models that adjust to fit. The all-in-twos tested at BabyGearLab range in lifetime cost from $255 – as cheap as a prefold diapers – to $547. Hybrid. Hybrid diapers are a particular type of all-in-two that can be used with disposable inserts, making them a “hybrid” between a cloth diaper and a disposable. For many parents, hybrid diapers are the best of both worlds. They can use cloth liners at home for their greater absorbency, then switch to disposable liners for their greater convenience when they’re on the road, or when the baby is at daycare. However, the reviewers at BabyGearLab find that disposable inserts are no greener than eco-friendly disposable diapers, and they’re not as convenient to use. BabyGearLab’s top-rated hybrid diaper has an estimated lifetime cost of $300. The cost of cloth diapering depends on the type of diapers you choose. As noted above, prefold diapers are the cheapest type, costing around $2.50 per diaper, with a lifetime cost of about $255. Modern diaper systems have a much higher initial cost – between $15 and $24 per diaper. However, when you compare lifetime costs, the difference isn’t nearly as dramatic. The top-rated cloth diapers at BabyGearLab are all one-size diapers, so once you have an initial stock of 30 to 36 diapers, you shouldn’t have to replace them. The absolute top pick at BabyGearLab, the Rumparooz pocket diaper, has a lifetime cost of $720. However, the editors give almost equally high marks to their second choice, the Flip Hybrid, which has an estimated lifetime cost of just $300. That’s only $45 more than the cheapest prefold diapers, and the system is much easier to use. The editors consider the slight extra cost to be well worth it. Just like disposable diapers, cloth diapers require a diaper pail and wipes. In addition, there are some extra accessories that can make the process of changing and washing cloth diapers a lot easier. Diaper Pail. With disposable diapers, you need a pail that will hold up to a week’s worth of diapers and keep their odor contained. Cloth diapers, by contrast, get laundered every two to three days, so you can get by with a smaller and simpler pail. Also, with cloth diapers you have the option of using a washable cloth liner, which can be laundered along with the diapers. According to BabyGearLab, you can buy “a quality pail with two washable cloth pail liners” for $100 or less. The old-fashioned method of soaking dirty diapers in a pail full of water doesn’t work with most modern diaper systems, and it’s a hassle anyway. Baby Wipes. Disposable baby wipes cost about $360 over a three-year period. However, cloth-diapering parents can easily choose reusable cloth wipes, which cost much less in the long run. The editors of BabyGearLab say $45 can buy you 48 “quality cloth wipes,” which should be enough to get you through your diapering years. These don’t necessarily have to be labeled as cloth baby wipes – many parents do fine with ordinary washcloths. Diaper Sprayer. Unless your baby is consuming breast milk and nothing else, a cloth diaper loaded with baby poop can’t go straight into the laundry – the poop has to be dumped out into the toilet first. (Technically, you should do the same thing with a disposable diaper to keep the poop out of landfills, even though most parents don’t.) You can dunk the diaper directly into the toilet and swish it around to remove the poop, but it’s easier to use a diaper sprayer. This is a nozzle that hooks up to the toilet’s water supply line and hangs on the side of the toilet tank, where you can just grab it and spray the contents of the diaper straight into the bowl. A diaper sprayer costs about $45 and can be installed in about 10 minutes. BabyGearLab recommends also using a $25 Spray Pal shield to keep the dirty spray water contained. Flushable Liners. Another way to deal with baby poop on a cloth diaper is to use flushable liners. These can just be lifted straight out, poop and all, and flushed down the toilet. In most cases, using a liner eliminates the need for spraying. Flushable liners cost about $0.07 each, so using one for every diaper change adds about $420 to the lifetime cost of cloth diapering. One way to cut this cost is to use diaper liners only when you are on the go and rely on the diaper sprayer at home. Laundry Accessories. Machine-washing and drying your diapers is another added cost. BabyGearLab notes in its laundering guide that many cloth diaper manufacturers recommend a “cloth-specific laundry detergent” that doesn’t contain fabric softener, which can leave bacteria-trapping residue on the diapers. All told, they say laundry adds about $200 to your lifetime diaper cost. Altogether, the lifetime cost of cloth diapering, from birth to potty training, can be anywhere from $600 to $1,870. This is a huge range, but it’s worth noting that even the most expensive cloth diapers and accessories cost no more over three years than value-priced disposable diapers. On top of that, you can reuse the same cloth diapers and accessories if you have a second child – something you definitely can’t do with disposables. With modern cloth diaper systems, the actual process of changing the diaper is more or less the same as with a disposable diaper. The extra work comes from cleaning the diaper afterwards. Discard Waste. First, you have to dump out any poop into the toilet. Using a flushable liner makes this part of the job easy, as you can just dump the whole liner in the toilet. However, flushable liners don’t work with septic systems or old, weak plumbing. If you can’t use flushable liners, you can rinse off the poop with a diaper sprayer. Rinse. Even if you are using a flushable liner, there may be some poop left clinging to the diaper that needs to be sprayed off. If you don’t have a diaper sprayer, you can wipe off the waste with toilet paper, but spraying is a lot easier. Rinsing is also a good idea if the diaper is heavily soaked with urine. The rinsed diaper can then be dumped in the diaper pail. Launder. In her guide to laundering cloth diapers, Dr. Juliet Spurrier of BabyGearLab recommends washing diapers every two days, or every three days at most. A baby goes through about a dozen diapers a day, so a standard washing machine can easily hold two days’ worth. Diapers should be washed on the standard hot water cycle rather than the sanitize cycle, which can damage the elastic and waterproof coating. Spurrier recommends setting the machine on “heavily soiled” to remove all the dirt from the diapers, and using “high spin” to clear all the dirty water from the tub. If you have a high-efficiency front-loading washer, you can achieve the same goal by running a short “quick wash” cycle followed by a “heavy duty” cycle. Dry. Each brand of cloth diaper has its own particular drying instructions. With some, you can machine-dry the entire diaper on low or medium heat; with others, the inserts can go in the dryer, but the diaper covers must be air dried on a clothesline or rack. This is another reason to avoid going too long between wash loads: Diapers need enough time to dry fully before you can use them again. The first two steps have to be done each time you change a diaper, adding a minute or two to each change. That doesn’t sound like a lot, but at 12 changes per day, it adds up to one to three hours per week. On top of that, each load of laundry takes perhaps 30 minutes for loading and setting the washer, transferring diapers from washer to dryer, removing the dry diapers, and folding them. At one load of laundry every other day, that’s another two hours or so per week. If your diapers need to be air dried, hanging them up and taking them down probably adds at least another hour per week. All told, keeping a baby in cloth diapers is a job that takes anywhere from three to six hours of work per week. A final point, as far as convenience goes, is that many daycare centers require disposable diapers. So if you have a baby in daycare, using cloth diapers isn’t always an option. However, you can choose to use disposables at daycare and cloth at home. You can also consult the Daycare Directory run by the RDIA to find a daycare center in your area that accepts – or even provides – cloth diapers. Many parents choose cloth diapers because they believe they’re better for the environment. Since they’re reusable, they require less raw material to produce, and they don’t take up space in landfills. However, cloth diapers have an environmental downside too: the energy and water required to wash and dry them. A 2008 study by the UK Environmental Agency found that the environmental impact of cloth diapers depends greatly on how you use them. If you wash full loads of diapers, line-dry them, and reuse your diapers for a second child, cloth diapers have a carbon footprint about 33% smaller than disposables. By contrast, if you machine dry your diapers and wash them in water hotter than 140°F, it’s the cloth diapers that have a bigger carbon footprint – about 80% bigger. Although cloth diapers don’t always come out ahead on carbon footprint, BabyGearLab points out that this study doesn’t factor in the amount of waste disposable diapers produce – not just from the materials in them, but from the feces they contain. The EPA points out that the average baby goes through about 8,000 diapers, which “last centuries in landfills.” Because of this, the editors of BabyGearLab give cloth diapers their vote as the greener choice. The editors of BabyGearLab say cloth diapers are less likely to contain toxic chemicals than disposable ones. Cloth diapers are nearly always free of chlorine bleach and synthetic fragrances. However, the editors note that many cloth diaper inserts are made from polyester fleece, a petroleum-based material. Parents who want to avoid all synthetic materials can choose cloth diapers that use only natural fibers. Another concern is diaper rash. Dr. Tanya Altmann, a California pediatrician, says in an interview with the health site WebMD that cloth-diapered babies are more prone to diaper rash because cloth diapers don’t contain wetness as well as disposables. However, some parents report exactly the opposite experience: Their children’s diaper rash cleared up when they switched to cloth diapers. According to Mayo Clinic, there’s “no compelling evidence” that either type of diaper is better overall, and parents should use whatever works best for them and their babies. A diaper service is a professional laundry that rents out reusable cotton diapers to families, hospital nurseries, and daycare centers. Each week, the service delivers a batch of clean diapers, takes away the previous week’s dirty diapers, and launders them. Using a diaper service allows parents to enjoy the benefits of cloth diapering without the added work and time of washing and drying the diapers themselves. In some cases, they don’t even have to rinse the diapers before returning them, but this varies from service to service. Using a diaper service is far more expensive than laundering your own diapers. Most diaper services charge around $20 for a week’s supply of basic prefold diapers – about 80 of them, for a newborn – plus a diaper pail with a liner and deodorizer. Some services also include diaper covers and cloth wipes, which can be laundered along with the diapers. However, in most cases you must supply your own covers to go with the service’s diapers. Over a three-year period – the estimate that BabyGearLab uses for the total time from birth to potty training – using a diaper service costs more than $3,000. This is nearly twice the lifetime cost of home-laundered cloth, even for the priciest diapers and accessories. And this $3,000 figure doesn’t even include the cost of diaper covers, which you must buy yourself. Compared to disposable diapers, using a diaper service is a toss-up. Disposable diapers cost anywhere from $0.14 apiece for an ultra-basic brand to $0.48 apiece for a high-quality green brand, while diapers from a service cost about $0.25 each. So depending on which brand of diaper you would otherwise be using, a diaper service can be a great value or a poor one. The biggest advantage of using a diaper service is having someone else take care of all the laundry. All you need to do after a diaper change is dump out the solids and toss the dirty diaper in the pail. This makes cloth diapering practical for parents who don’t have a washer and dryer at home. However, one downside of diaper services is that most of them offer only the basic prefold diapers. This makes changing your baby a bit more of a hassle, since you have to fold the diaper, put it on and secure it, and then add a separate cover. Several diaper services offer delivery of all-in-one diapers, but these tend to cost much more than the prefolded kind. One service, Green Diaper Babies in the Chicago area, charges $56 a week for all-in-ones, and only $24 a week for prefolds. Another drawback of diaper services is that most daycare centers don’t allow prefold diapers. Many daycare services don’t allow cloth diapers at all, and others accept only the easier-to-use diaper systems. So unless your daycare facility has its own diaper service, using one probably isn’t an option. However, the biggest problem of all with diaper services is likely to be finding one in your area. The National Diaper Service Directory run by the RDIA only lists around 50 services in the United States and Canada, and most states have none at all. It’s tricky to say how the environmental impact of using a diaper service compares to washing at home, because there are so many factors involved. The actual washing process is likely to be more efficient, since many diaper services have special washers and dryers that use far less water and energy than home machines. Some services also claim to use environmentally friendly detergents free of phosphates, dyes, and perfumes. On the other hand, some diaper services stress the fact that their diapers are “sanitized” because they’re washed in 160°F water. Experts say there’s no need to wash diapers at this temperature, and the UK Environmental Agency says doing so increases the carbon footprint of cloth diaper use. In addition, using a service means shipping diapers to and from your home in a truck, which uses fuel and creates pollution. Overall, the environmental impact of using a diaper service depends on the specific service you use. Being farther away from your home makes it less green because of the transportation involved; washing diapers efficiently, by contrast, makes it greener. If you can’t find information about the laundering process on a diaper service’s website, you can call and ask. Health concerns are also hard to evaluate. The RDIA says diaper services “launder diapers to rigorous public-health standards that you couldn’t possibly match at home, with 13 changes of water and high-temperature drying that eliminates bacteria.” However, most diaper services use old-fashioned prefold diapers, which BabyGearLab finds to be less absorbent than other types. As a result, diapers from a diaper service probably won’t do as good a job of preventing diaper rash. There’s no single answer to the question, “Which kind of diaper is best?” Ultimately, it depends on what’s most important to you. If price is your top priority, home-laundered cloth diapers are definitely the way to go. You can save the most with basic prefold diapers, but hybrid diapers are easier to use and not that much pricier. If convenience is the main concern, then you should either go with disposables or use a modern cloth diaper system with a flushable liner. A diaper service is also a reasonable option, but only if there’s one available in your area. If your main goal is to pick a diaper that’s environmentally friendly and safe for your baby, cloth diapers are best overall. Disposable diapers can be a reasonable choice if you pick a green brand, but you should expect to pay more for them. What’s your top priority where diapers are concerned? Which kind do you think best fits your needs?